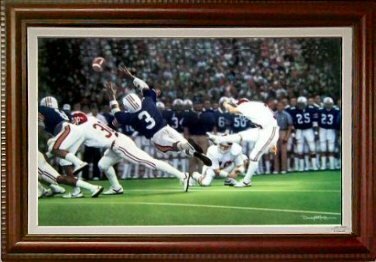 "Kick I" - Daniel Moore's tribute to Van Tiffin's game winning kick over Auburn. In 1985, quarterback Mike Shula marched the Alabama offense down to mid-field. Then, with 6 seconds left on the clock, Van Tiffin kicked a 52-yard goal bestowing a 25-23 victory on Alabama in the 50th Iron Bowl.